The highly anticipated new Rouge Coco Stylo Complete Care Lipshine, launched by Chanel for spring 2016, has just hit the counters! I found out it was available both online and at my local store late Wednesday night, and went for a trip to the mall yesterday to take a look at this brand new lippie. I know that many of you were excited or intrigued about this new release, so I decided to post some pictures, swatches and my first impressions about the formula as soon as possible! I'm going to throw my thoughts out in no particular order, sorry if this post is less structured than what I usually do - and also for the distracting shadows on the photos, I snapped them late in the afternoon. 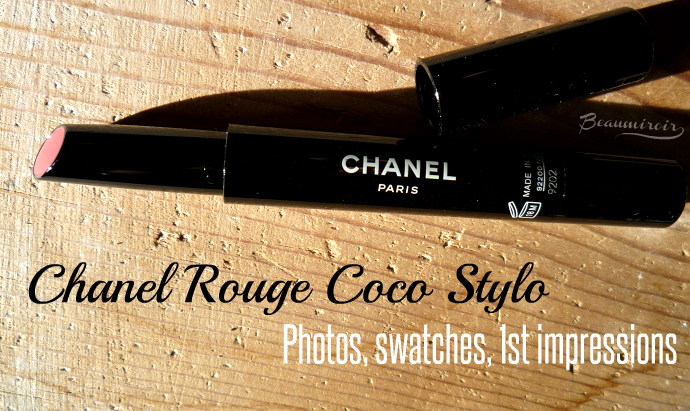 I promise I'll give the Rouge Coco Stylo a more classic review soon. - The packaging is reminiscent of a discontinued Dior lipstick called Sérum de Rouge - in fact it's almost identical. The Sérum de Rouge disappeared from Dior's range to be replaced by the Rouge Baume in the fall of 2014. You turn the end of the long, thin plastic body to get some lipstick out, and the good news is that it comes back in when you turn it the other way (not always the case with this type of packaging). The pen is sleek and perfect to throw in your purse, but it's also quite basic. 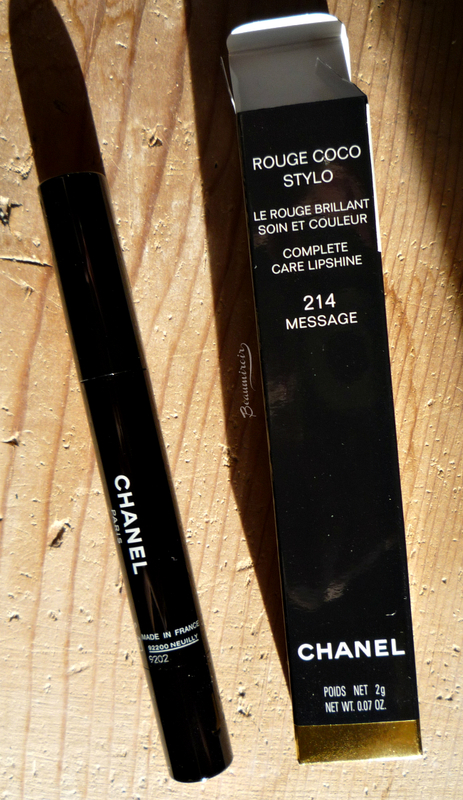 - Holy cow the Rouge Coco Stylo is GLOSSY. You know how sometimes brands launch glossy lipsticks and use words like "extreme shine" in their description? Well, in this case, it couldn't be more true! It's as shiny as any good lipgloss. 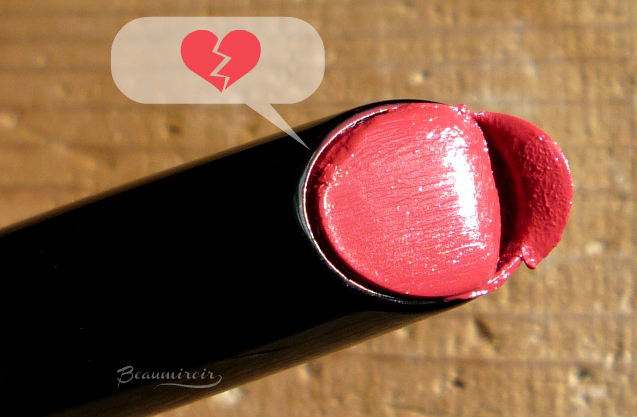 It's like a vengeful response to the current matte lip trend! - Holy cannoli the Rouge Coco Stylo is also PIGMENTED. Super intense and surprisingly opaque for such a glossy formula. All the shades have amazing color payoff, except maybe the light pink #202 Conte. - The texture is extremely thin and soft, it almost feels like... liquid gloss in a stick? Or semi-melted butter? I have lipglosses that are thicker than this Stylo! It literally melts on contact, turning into a lightweight fluid. I haven't yet tried the new YSL Rouge Volupté Oil-in-Stick, but that name would also be a good way to describe the Rouge Coco Stylo. It feels very comfortable on the lips, like an oil would, and it's not sticky at all. Because of that incredibly fragile stick, I can predict that testers at counters are going to turn into a huge mess in just a few days! The ones at the store I went to were brand new, but I have no doubt that by the end of the weekend, the whole display is going to be covered in smudged Lipshine! The accident... See how soft the texture looks? - The color coverage can be a little uneven. Some shades seemed to be affected more than others, #202 Conte, #212 Récit and #216 Lettre in particular. Even with my shade, #214 Message, it gets a bit uneven if the plastic tube around the stick touches the lip: it kind of scrapes off any lipshine that was already there. In other words, you have to turn the base of the pen to get enough product out so the plastic won't get in contact with the lips, but not too much or the stick will get smushed and break apart. There's a balance to find here! accurate but more intense in person. - The color transfers quite a bit, however its wear time is surprisingly long: it was still going strong last night after a whole meal mostly consisting of pulled pork tacos (tacos are a lipstick killer). The shine was gone but my lips had a nice, vibrant stain. 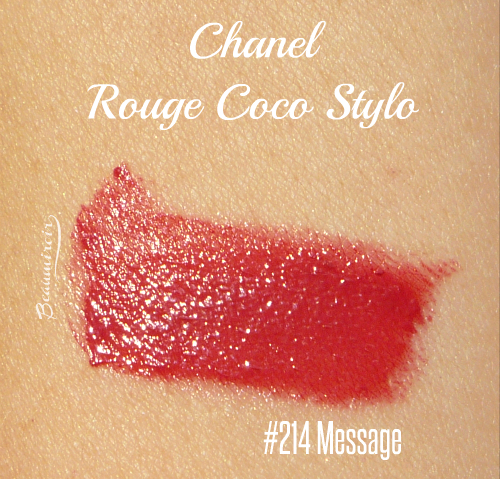 - Message is the kind of shade I have a hard time describing: it's deep warm rose with hints of brick red. It has a slightly muted quality but remains vibrant, and I think it's very pretty. while indirect natural light at the bottom brings out the pink tones. - Stylo in French means pen. All the shade names are inspired by literary work, or just things you can write: #202 Conte = tale, #204 Article, #206 Histoire = story, #208 Roman = novel, #212 Récit = story/narrative, #214 Message, #216 Lettre = letter, #218 Script. 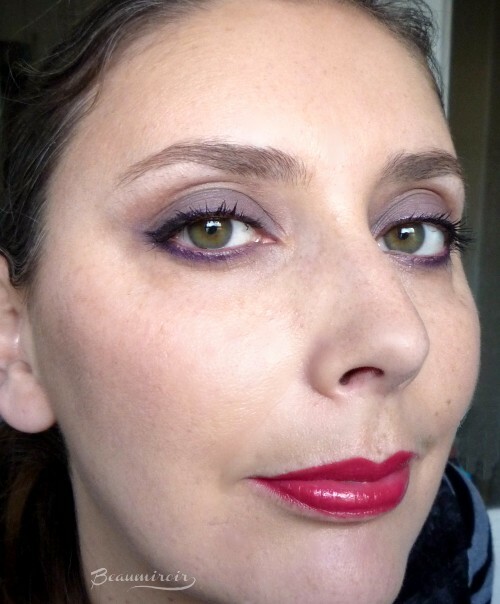 with cool lilac and purple eyes, but that's what I had on to go to the mall! Overall: so far I'm enjoying the intense color payoff, lightweight gloss-in-a-stick texture and highly shiny finish, but I'm a bit concerned that the stick is so fragile. Handle with care! 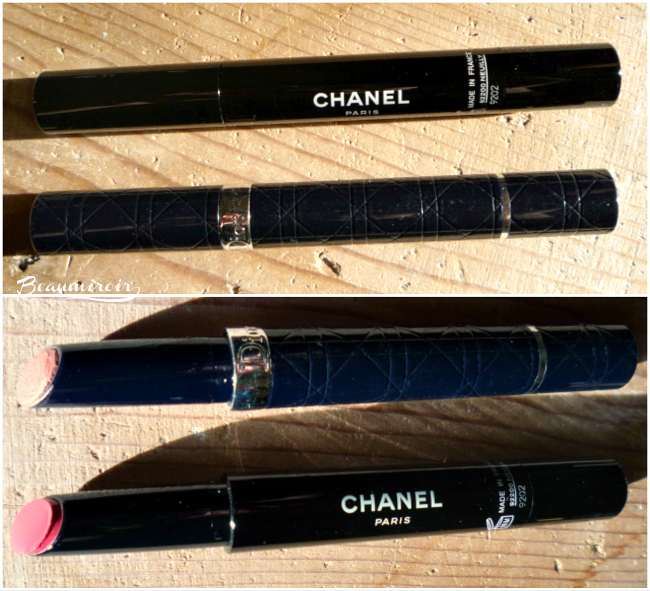 Are you planning to try this new lipstick by Chanel? 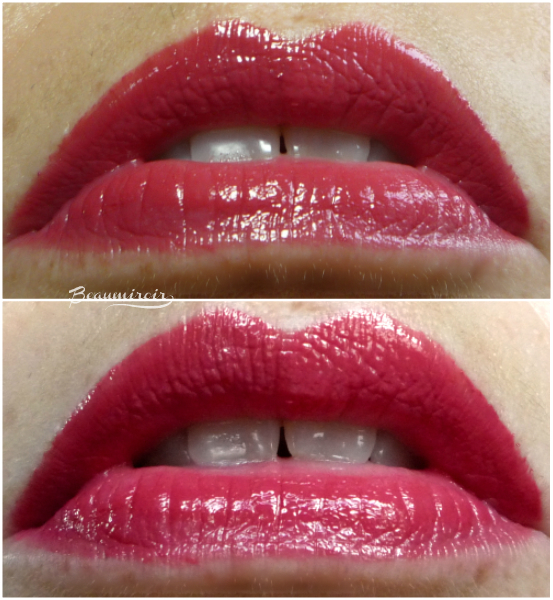 Do you prefer glossy or matte lipstick? Where to buy? At your local counter and online at Nordstrom, Neiman Marcus. Retail price is $37 (ouch).